Recipes so wholesome, nobody will guess a tin was involved. I ALWAYS HAVE a shelf full of tinned food to fall back on if I need a quick meal. From tins of tuna to fruits and pulses, tins are an essential part of my monthly shop. They are so handy to have on hand when you need a “raid the cupboard” meal in a hurry. Most tinned foods are packaged very soon after they’re harvested, meaning optimum levels of nutritional benefits are retained. Tinned salmon for example is an excellent source of omega-3 fatty acids, which are important for heart health, as well as being an excellent source of protein. Chickpeas provide a low fat source of protein, and count towards one of your recommended daily portions of fruit and veg. The below recipes can be whipped up in a flash using store cupboard ingredients, and they’re so wholesome that nobody will ever guess that the star of the show comes from a tin! 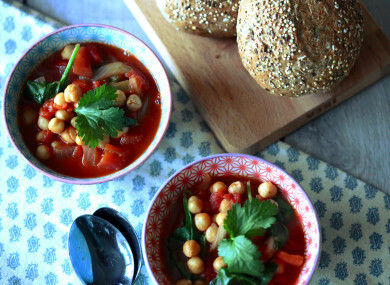 The humble can of chickpeas is the main ingredients in this deliciously warming broth. Paired with just a few other household staples, this soup is very easy on the pocket and full of nutrients. Want to change things up? For an extra protein kick, feel free to adapt the recipe and add in some leftover meat if you have it. Served with some salad, these fishcakes make a delicious lunch. Or for an equally impressive brunch, top the fishcakes with a poached egg. Email “One-can dinners: Essential recipes for a 'raid the cupboard' meal in a hurry”. Feedback on “One-can dinners: Essential recipes for a 'raid the cupboard' meal in a hurry”.